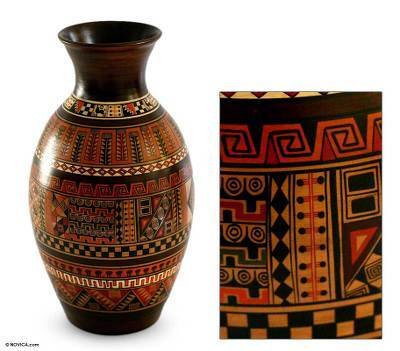 Handmade Cuzco Style Decorative Ceramic Vase, "Sacred Inca Valley"
The unique iconography of the Inca tells of when to sow, when to harvest and when to shear the alpaca and llama. Known as tocapu, this pictorial alphabet comes from the Sacred Valley of the Inca Empire, which goes from Pisaq and Ollantaytambo, parallel to Vilcanota or Wilcamayu River, in Cuzco. Rolando and Luis paint this inspired ceramic vase by hand. 36 cm H x 19.5 cm Diam. 14.25" H x 7.75" Diam. Rolando and Luis has received 6 microcredit loans with 0% interest from Kiva and Novica, the first for $200 and the most recent for $350. Proceeds were used to increase their stock by investing in the purchase of clay and pigments in larger quantities. "My hope is to share Peru's antique art by explaining the customs and beliefs of our Inca ancestors. To me, our compositions reveal the human aspect of this millenary culture." Rolando and Luis Huaman Paucar have inherited their ceramic art from their parents, who are also Novica featured artists, known as the Huaman Paucar Family. Rolando speaks: "I was born July 19, 1976. My mother taught me and my siblings how to paint on ceramic; it is an art form that flows through our veins. Our parents taught us to appreciate this art from a very young age, and with time and practice I have been able to refine my skills. I'm constantly trying to improve and diversify, so I'm always reading books or researching more about our culture on the Internet. "When I was a little boy, I so wanted to help out that I would paint plates and offer them to my parents to sell, who instead kept them. Now I look at them and I think to myself, 'How could I have ever painted that!' There was no way my parents would have sold my 'first works of art.' They were too kind to tell me they were really bad! Instead, they treasured them. "As a child my two favorite things to do were painting and pulling things apart to then put them back together. That's why I studied engineering, but today I'm lured by colors, mixing them, and painting with them. I love to combine a great variety of colors along with Inca glyphs and warriors. I love the geometrical styles that underscore Inca art. "My motivation to continue in this art comes from my admiration of Inca artistry and customs. My hope is to share Peru's antique art by explaining the customs and beliefs of our Inca ancestors. To me, our compositions reveal the human aspect of this millenary culture." Luis now tells his story: "I was born on November 9, 1984, and I owe my artistic formation to my parents, Gerardo and Dina, who shared with us their passion for this art form. To this day I still feel lured by the mystery that surrounds the art of the Inca. "I studied computer networks, but my heart and hands were always pining for the art of painting and its different pathways. I am constantly reading and researching all that I can about my beloved Peru. "I've had some funny experiences along the way, like when I first started painting my works of art (if you could call them that), they came out all weird and funny. However I never gave up, and I continued practicing until I developed my own style. As a kid, my passions were painting, music, and soccer. Now painting has taken over my life. "I describe this kind of work as art that breathes life into any setting. My inspiration comes from my admiration toward all the different cultures in my beloved Peru. My intention is to convey the mysticism surrounding Inca cultures. To me, the work we do expresses the essence of our country as well as that of our Inca ancestors. Our goal is to preserve the family legacy we have inherited. "We would like to tell Novica customers that we work with dedication and passion. Our hands craft high quality pieces that are filled with our fondest regards to you. Gracias!" The brothers use the initials of their two last names for their signature, HP. Your beautiful vase arrived today! I was worried about damage but it was so well wrapped and was in perfect condition...I love it, thank you!